Roger Federer needed one more set than he would have liked to beat Juan Carlos Ferrero in the 3rd round of the Italian Open in Rome, but he still won comfortably in the end, 62 57 61. It was the first meeting between Federer and Ferrero since Wimbledon 2007. A few games into the match, Roger ran away with the first set in half an hour. He played sublime tennis and was hitting incredible winners from every part of the court like only The Fed can. The second set was more difficult, and Roger played lackadaisically, while Ferrero maxed his game, creating a break for the Spaniard in the 11th game. He held after being down 0-30 and won the 2nd set 7-5, shockingly. However, the set win was a momentary win as Fed got up an early break in the 3rd to take charge. He added another break to take the match, 62 57 61 in an hour and forty-seven minutes. Roger got through the match while serving at only 51%, which is quite frankly outstanding (that he came through in 6-2 and 6-1 sets, not the serve percentage). The quality of play in sets one and three was so good that he did not need to rely on his serve to make things happen. Added to that, Ferrero served at 79 percent. Overall, it was a fine match on both sides: we saw the great, stylistic play of Federer and we also saw the best of Ferrero, which is great to see at his age (32). Federer used all his variety to stun the audience; he hit forehand and backhand winners equally brilliantly, and he mixed in some drop shot masterpieces as well as some cute drop shot fakes, which always bring thoughts of Roger trolling his opponent. As some commentators would say, the weapon had been sharpened, and his full repertoire was on display (which is a much fuller repertoire than anyone else). Novak Djokovic needed three sets to get through Juan Monaco 46 62 63. On the contrary, Rafael Nadal breezed by Marcel Granollers in a double breadstick, 61 61. Berdych beat Almagro, Ferrer beat Simon, Tsonga beat del Potro, and Richard Gasquet upset Andy Murray 67(1) 63 62. (Ironically, this is the second straight year Gasquet has upset a top player in the 3rd round, as last year he beat Roger in the 3rd round as well.) Andreas Seppi overcame Stan Wawrinka in three tiebreak sets, saving 6 match points to amaze his home crowd. Where Seppi had his dream performance and became a hero in front of his Italian crowd, Andy Murray keeps struggling. Since Dubai, Andy has not made it to the semifinals of all but one tournament (Miami), losing to Guillermo Garcia-Lopez in the 2nd round of Indian Wells, Berdych and Raonic in the quarters of Monte Carlo and Barcelona, and now here vs Gasquet in Rome. Things are not looking good for his Roland Garros chances. Should he go out early there, it makes it all the more important that Roger have the chance to be on the opposite side of the draw from Djokovic and Nadal, if possible. The biggest chance for an upset is likely Berdych vs Rafa, if only for how great Berdych played in Madrid, and he seems to have carried the momentum over. I can't see Seppi beating Roger of course, and Djokovic should take care of Tsonga, but you just never know with Jo. 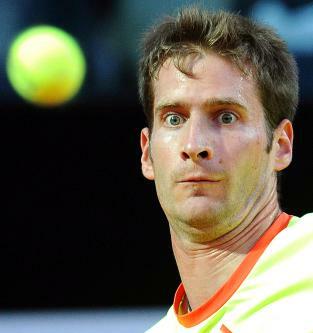 Ferrer should handle Gasquet, even if Richard does play very well on this Rome surface. Had to add this picture. Mayer's eyes make me laugh. So, onto the quarters we go. If Fed wins, then Rafa will need to win the title to get back the #2 spot before the French Open. May the best of luck to all of them and may the best man win. Good analysis. Especially the Trollerer part!